Barbecan Speed-Sensitive Secure Entrance systems are electronically controlled door systems with in-motion weapon detection to absolutely STOP an attacker. One or more Barbecan entrance systems are deployed such that the only way to enter (or exit) a secured area is through a Barbecan system. Spaces adjacent to and above the Barbecan entrance system are sealed to prevent weapon passing between multiple attackers. The direction of flow through a Barbecan entrance system is electronically controlled and may be changed at any point in time. At any instant in time, the flow through the device is unidirectional. A single entrance system may also be used Bi-Directionally - reversing direction on demand. The integration of cameras and scanners into door panels that move with a subject enables in-motion weapon detection and advanced biometric scanning. Barbecan Secure Entrance Systems are superior to all conventional turnstiles and man-traps, especially where high traffic throughput with absolute security is a necessity. In the future, Barbecan entrance systems are perfect for use with walk-through millimeter and micro-wave scanning technology for next generation explosives detection in high traffic applications. Even with metal detection alone, the system detects all guns and most bombs (since shrapnel is always added to make explosions more deadly). Besides vulnerable soft targets like Subways and Schools, a Screening-at-Speed solution is also important for the next generation enhanced checkpoints TSA is developing to shorten those long, long, lines we all endure at airports. Barbecan entrance systems are space (width and length) efficient while offering extremely high throughput, such that subjects attempting to walk through may walk continuously. The Barbecan Non-Stop Secure Entrance System is suitable for operation at the entrance to many "Soft Target" facilities where people gather, including: Subway, Train, and Bus Stations; Airport Main Entrances; Theaters; Malls; Stadiums and Conference Halls; Government and Commercial Office Buildings; Hotels; Banks; Churches, Synagogues, and Mosques; Factories; and Schools, Colleges, and Universities. For some high security applications, video imaging may also be included such that a pedestrian’s face is observed as they walk through an entrance system. Observing and analyzing the expressions on a person's face have been shown to offer clues to that person’s state of mind - especially when they are contemplating a violent act and/or self-destruction. While this area of science may seem somewhat extraordinary, the Department of Homeland Security has significant efforts in this area and the technology is real. Upon an emergency such as a fire or earthquake, all entrance systems may be automatically set to a mode enabling rapid exit of the secured premises. Alternately, Barbecan entrance systems are capable of being electronically controlled to be placed in a mode where all doors are fully open and individuals have unimpeded capability to exit a premises in an emergency. Weapon passing from one subject to another through a Barbecan entrance system is not possible. 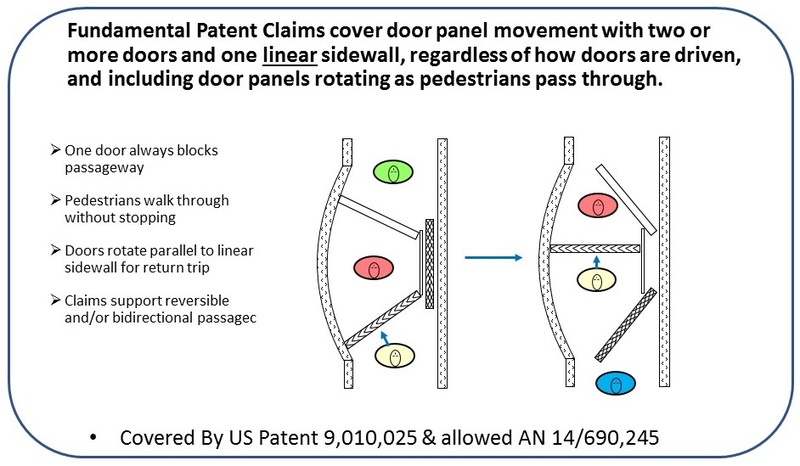 For one potential entrance system implementation (see animation video), any gaps that exist between a door panel and a side panel at any point during the motion of that door panel are blocked. Tailgating is eliminated as the Barbecan entrance system will not release two subjects unless it is programmed to do so. Note that the top covers of Barbecan entrance systems in the animations have been removed for clarity. 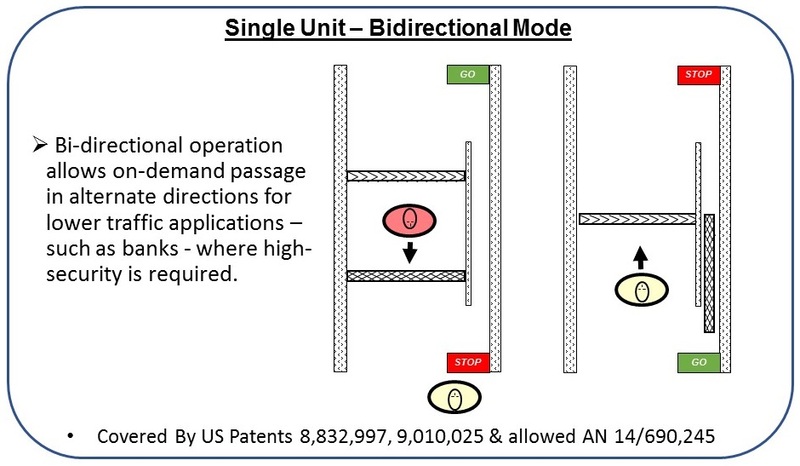 A single Barbecan Entrance System may be used alone for high security applications with less traffic flow - like banks - in Bi-Directional mode (patents granted). Barbecan's Speed-Sensitive entrance systems have numerous optical sensors such that movements of the moving door panels within an entrance system are able to follow and track the movements of each person passing through. 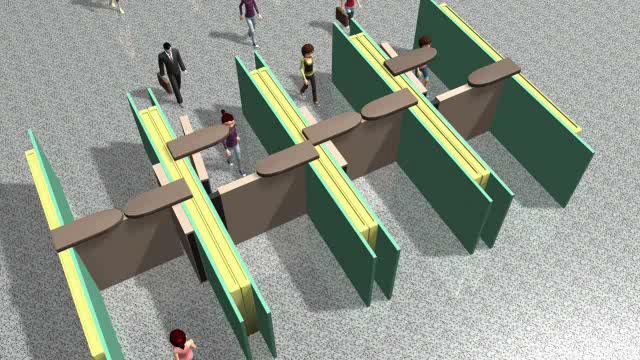 The panels move quickly for a fast moving person and slower for a person moving slowly, thus maximizing the throughput rate of the entrance system by adapting to each person's rate of movement. 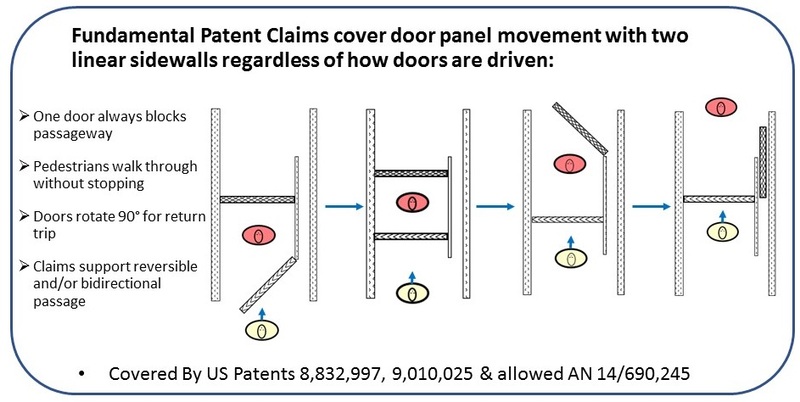 To do this, door panels are driven by electro-mechanical means controlled by a computer/processor in true robotic fashion. The people location sensors in door panels and side panels ensure that door panels never touch individuals passing through, maximizing user safety. Multiple Barbecan entrance systems may be stacked side by side to allow further increases in traffic flow. When multiple systems are stacked, the number of entrance systems allowing flow in one direction relative to the opposite direction may be varied - either manually or automatically - according to time of day or according to demand. For one option, a central control system for a stack of entrance systems makes decisions on the directional flow of individual entrances within a stack based on information describing the aggregate directional flow, and magnitude of flow, of a crowd of subjects as determined by sensor(s) that observe the areas on both ends of an entrance system. Such flow sensor(s) may use visual, sonar, lidar, IR, RF, or floor pressure sensing technology. As part of this directional control, a particular entrance system may need to change direction from time to time. When an entrance system is about to change direction, a message is displayed on that entrance it will soon change direction and cease to allow passage for those currently in line should a queue exist. This message can also count-down the time remaining so that individuals who will need to move to a different entrance system are properly and fairly notified in plenty of time to make the move. For a short time during each passage of a pedestrian, two of the moving door panels are parallel - forming a detection chamber. 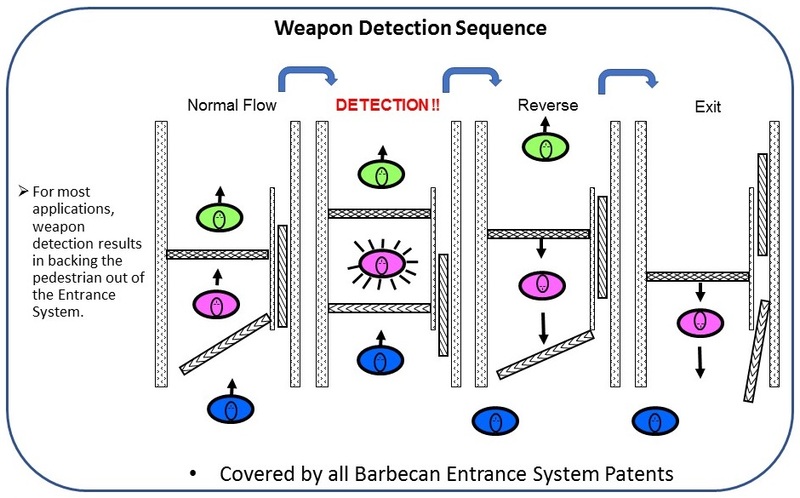 During this brief time period, numerous threat sensors within the Barbecan entrance system determine if a weapon is present and if there is a positive threat indication. If there is, the forward progress of the Barbecan entrance system is stopped. At this point, in most scenarios the Barbecan entrance system will reverse and back the subject out of the entrance. Sensor technologies incorporated within a Barbecan secure entrance system, may include but are not limited to metal detectors, chemical, explosive, biological, and radiological sensors, as well as different scanning technologies including x-ray imaging and penetrating RF imaging such as (UWB) radar imaging or millimeter/micro-wave imaging. Passive Millimeter Wave Imaging is especially promising as it operates while subjects walk past and can make threat determinations in less than 1/2 second. The Barbecan entrance system is a platform where threat sensors are included as required for specific applications. Airport secure area exits, for instance, do not require sensors. Just a fool-proof one-way door. A fair manner of passage is arbitrated between ingress and egress, typically alternating between directions of passage or allowing passage on demand. Signs on each side of a door system show "STOP" or "GO" appropriately. Claims in issued patents support this mode. The Barbecan Entry System includes an emergency mode where all doors are moved to be flat against a sidewall to allow unfettered exit of persons from a building. How this mode is triggered is critical. Modern fire alarm systems in buildings do not allow anyone to pull a lever and automatically cause all exit doors to open. That archaic system is reminiscent of 19th-century train cars where anyone can pull a cord - bringing the train to a screeching halt. With modern cell phone location-based technology, authorized (responsible) individuals distributed around a building can initiate and validate an emergency alarm, and that in turn can cause entry systems to enter emergency mode for exiting. In the Parkland massacre, the shooter activated the alarm causing people to exit as part of his plan. That school fire alarm system was scheduled to be updated to a modern system, but that had yet to happen. Door panels and side panels are fabricated from bulletproof material. Barbecan entrance systems are capable of operating unattended for extended periods of time. A stack or gang of Barbecan entrance systems may also operate unattended, or alternately may require only minimal attendance. For instance, a single security guard may preside over a stack or gang of multiple Barbecan entrances. A companion Robotic Baggage Scanner is in development and covered by our Patents. Baggage scanners synchronized with Barbecan pedestrian entrance systems will be especially useful at Hotels and at main entrances to Airport Terminal Buildings. Today, a terrorist can bring weapons into any Hotel - testified to by the incidents in Jakarta and Mumbai. Similarly, weapons can easily be brought into Airport Terminal Buildings (ticket counters and baggage claim areas) - testified to by incidents in Belgium, Russia, and the US. These vulnerabilities need to be eliminated.